The hats of the Cambodian mushrooms are shaped as the Asian conical hats disclosing their origin. 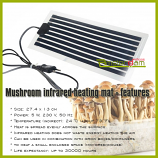 This variety is the perfect species of mushroom for growers who do not have a lot of experience cultivating these mushrooms. These mushrooms are very easy to grow and have a relatively predictable yield. You might find some trip report in our review section. The Psilocybe cubensis 'Cambodia' magic mushroom 100% mycelium grow kit is slightly different than the grow kits you might have seen before. 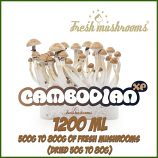 No fillers and contain an average of twice as much active substance psilocin as other brands of cambodian shrooms that are available on the market. We offer 1200ml boxes easy to grow, see our growguide. We ship xp grow kits world wide in plain boxes. For information about payments like bitcoin, shipping and ordering visit our helpdesk or use the contact button on the webshop pages.